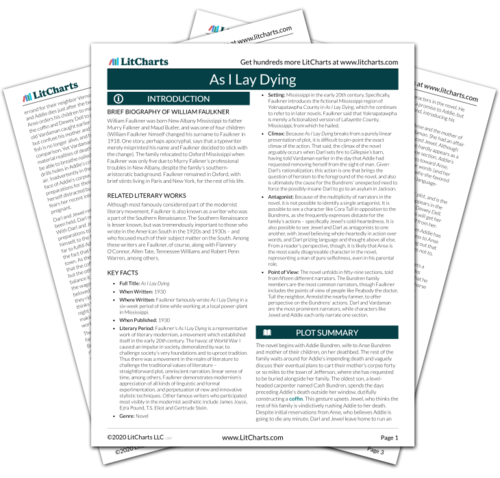 Instant downloads of all 942 LitChart PDFs (including As I Lay Dying). 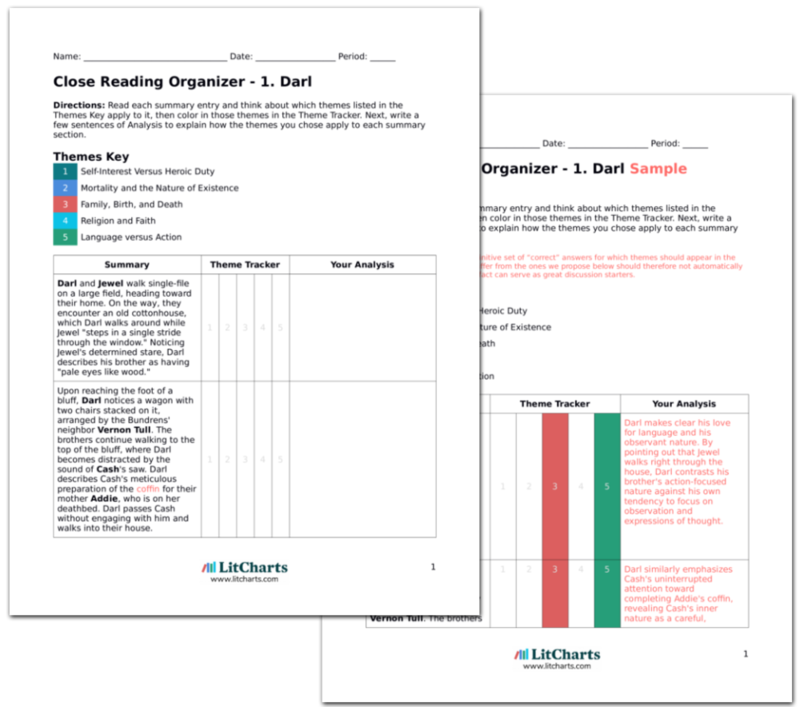 LitCharts assigns a color and icon to each theme in As I Lay Dying, which you can use to track the themes throughout the work. Having come to the Bundren household to take care of Addie in her last moments, Cora thinks about Darl's sweet disposition as she watches say goodbye to Addie. In particular, Cora contrasts Darl to Jewel, who she recalls was Addie's most "coddled" child. Yet Cora finds Jewel coldhearted, comparing him to Anse, who she believes is selfish and lazy. Cora's opinions offer an enlightening alternative perspective to those of the Bundrens. Cora here highlights the dichotomy between language and action that is highly relevant when comparing Darl and Jewel. Thus, Cora foreshadows the question of why Jewel is set apart from the Bundrens, and why he might've been Addie's favorite. Cora and Tull reflect on the Bundrens' plan to trek forty miles to bury Addie in Jefferson. Cora finds the plan preposterous, while Vernon defends it using Anse's argument—that it was Addie's "own wish." Cora dismisses her husband for listening to Anse and then reflects on how lucky she feels to be an honorable Christian, someone who will die surrounded by the love and respect of her Christian family. Dewey Dell asks Darl what he wants, but Darl does not answer and instead continues to stare at Addie. Cora reasons that his heart must just be "too full for words." Cora's criticism of the Bundrens' plan to go to Jefferson and her remarks on her own purity of faith show how successful Cora is at using language to elevate herself—in this case, as an honorable Christian unlike any of the Bundrens. Cora calls into question whether the Bundrens' journey is truly the fulfillment of a "sacred promise," in the words of Anse, and offers another way of seeing the journey—as absurd and impractical. Lieberman, Charlotte. "As I Lay Dying 6. Cora." LitCharts. LitCharts LLC, 5 Aug 2013. Web. 18 Jan 2019. Lieberman, Charlotte. "As I Lay Dying 6. Cora." LitCharts LLC, August 5, 2013. Retrieved January 18, 2019. https://www.litcharts.com/lit/as-i-lay-dying/6-cora.